One of Deb's new Wacky Whiskers. Mozart is one of Deb & Glenn's six rescue kitties. Mozart is a grey long haired tabby. Of the six rescue kitties, Mozart is probably the little trouble maker! He is the one that shreds the toilet paper! Gandhi and Mozart are litter mates. 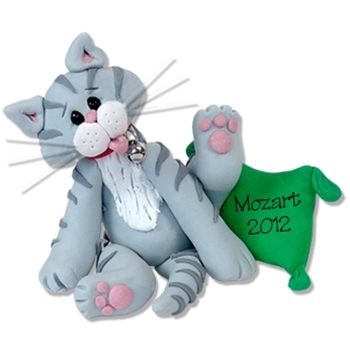 Mozart may be easily personalized with a name on his pillow. Handmade from polymer clay and designed by Debi Allison. She is packaged in her own little clear acrylic box with a cute background that may also be personalized.